The 11th annual Think Pink campaign was once again a huge success for the Department of Athletics and Recreation. The annual event held during the month of November is an important fundraising and awareness campaign that touches many across campus who have been affected by breast cancer. This year the campaign raised $15,782.26 for the Breast Cancer Cause at the Canadian Cancer Society (formerly the Canadian Breast Cancer Foundation, CBCF), making it an incredible 11-year total of $229,703.29 raised for the cause. “Our campus really gets behind the Think Pink movement and our students become driving forces behind our fundraising efforts,” Jenny Mackay, marketing, events and outreach manager said. “It’s not only about the money raised but about the awareness the campaign brings to the cause and I am very proud of our efforts to help advance the research for Breast Cancer. From our students to our staff to the community, everyone seems to rally around Think Pink,” Mackay said. 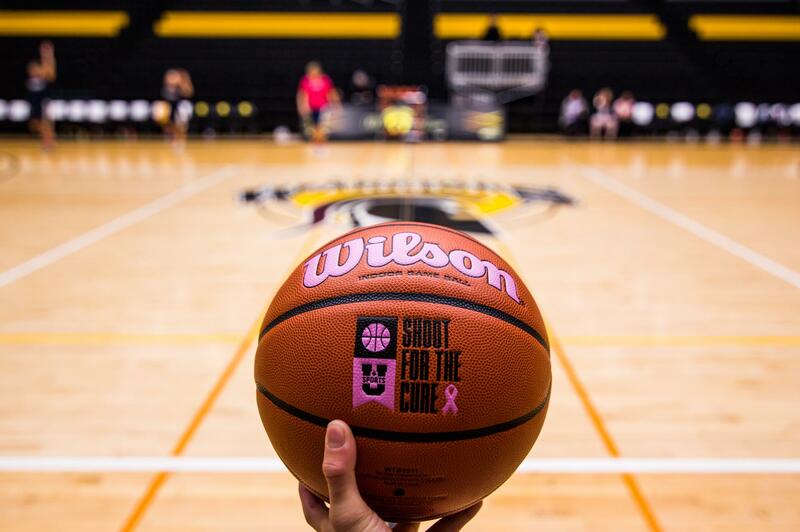 The Think Pink campaign originated from the U SPORTS women’s basketball coaches association and expanded to a department wide initiative that runs on a yearly basis. Many schools across Canada have taken on this initiative and have provided thousands of dollars in donations to the CBCF.Throughout the month of November, the athletics marketing team put on a series of events to attract students and fans to varsity games and Warrior Recreation programming to help raise money and awareness. Fans and students were treated to six different varsity games, a 3-on-3 indoor soccer tournament, and many more fundraising initiatives this year. As part of the fundraising efforts, there are team challenges to see which varsity team can collectively raise the most funds. This year, the women’s basketball team raised the highest percentage of funds with a total of $4,097.07 ($256.07/student athlete), Women’s soccer played a massive role as well, raising the second highest with a total of $2,748.92 ($114.54/student athlete). Women’s hockey rounded out the top three fundraising efforts, bringing in a total of $1,750.00 while several individuals from the men’s track and field team helped bring in close to $1,000. The highlight of this year’s Think Pink campaign was the hair cutting and shaving by members of our varsity programs and the campus community. At a men’s hockey game, three players and one coach shaved their head for the cause while at halftime at a Men’s basketball game 19 brave souls cut their hair and shaved their heads. The hair of these Warriors was donated to several organizations that provide hairpieces to those who have suffered long-term medical hair loss from any type of diagnosis.